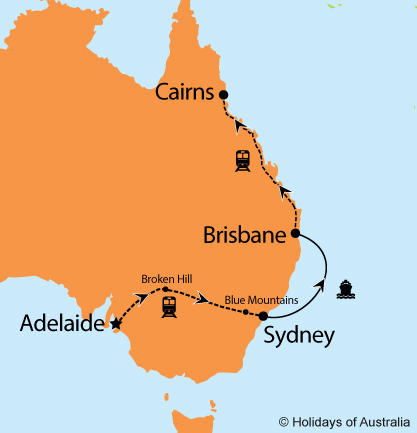 Discover the highlights of Brisbane and Cairns as you travel up the East Coast in style on this cruise & rail journey. Discover the charm of rail travel aboard the Indian Pacific & Spirit of Queensland. Relax aboard Sea Princess as she carries you up the East Coast. Immerse yourself in the surrounds of the sub-tropical rainforest of the Green Mountains. Tour through the picturesque mountain retreat of Kuranda village surrounded by World Heritage-listed rainforest. Images courtesy of Queensland Rail, Princess Cruises, Great Southern Rail, Tourism & Events QLD, Tourism Australia.